It might seem like I haven’t picked up an atlas in a while since Green Prophet is devoted to Middle Eastern issues, but this story from Treehugger about a Brazilian beekeeper and his appropriately-suited helper was just too sweet not to share. Manuel Juraci is one of 120 beekeepers in Itatira, Ceará who produce massive quantities of honey each year. This is an excellent trade for one of the world’s poorest regions, though it’s difficult to get ahead. But Juraci has a special tool that makes him one of the most competitive of all beekeepers: a donkey. 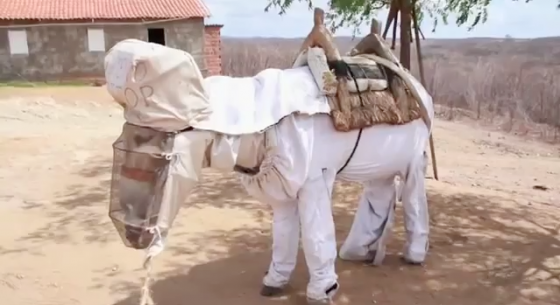 Outfitted in a custom suit designed by Juraci that keeps him safe from bee stings, Boneco the trusted donkey transports the honey that Juraci collects down to the marketplace. 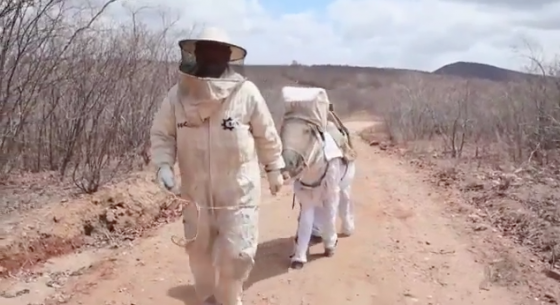 This team work ensures a greater carrying capacity than other beekeepers can have, and the Association of Honey Producers is keen to commission more donkey beekeeping suits from their designer. And that might help, but Juraci insists that the secret behind their success can’t be attributed to the suit. It’s the donkey’s friendship and loyalty that matters the most.